I had a question this morning from someone on our Facebook Fan Page regarding how to add UStream live video to your WordPress blog. This was a great question and one I felt needed to quickly be posted so that you all can see exactly the best way to make this happen. 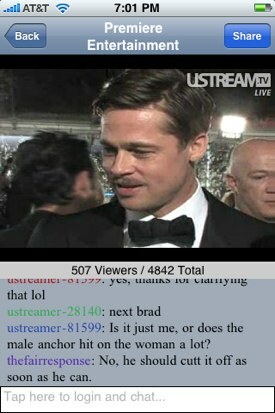 As you may know already, USTREAM.TV is a basically a place for anyone to broadcast themselves live on the web. You can sign up for an account for free, hook up your web cam or video, and that’s it – you’re now an Internet super star! For those of you who love WordPress, much like I do, I’ve found the simplest, and most robust plugin to use is called “WP USTREAM”. This allows you to not only embed your live UStream broadcast into your WordPress blog, but you can also add your UStream Chat Room as well. WP USTREAM allows you to customize the size of the video stream box so that you can integrate into your WordPress blog wherever, and how ever you like. Plus, with the ability to embed your UStream Chat Room, you can literally create your own page that has your broadcast streaming video along side of your chat room – pretty cool huh? And yes, for those who just absolutely need UStream on the go – there’s an app for that! Check out the UStream iPhone App – this is basically a UStream viewer that allows you to easily login, watch live streams, and even chat in the chat room – all from your iPhone! Learn more about WP USTREAM (the UStream WordPress Plugin), and from there you can also download the plugin and get started. Of course, if you haven’t already, head over to UStream and create your free account and start broadcasting yourself. Any idea why I'm getting the following message when accessing "WP-Ustream"? I'm on the latest WP version. Hi Alex – it sounds like you're running an old version of WordPress that UStream isn't liking. Also, I recommend you upgrade to the latest WordPress (2.8.5) which can typically be done automatically from your dashboard. Is there a fix or does it not work anymore ??? I got the options page to show up. Haven't had a chance to see if it will still display streams but I'm hoping. Here is the culprit: "add_action('admin_head', 'wpustream_add_options_page');" It is the 3rd line from the bottom. I changed it to. "add_action('admin_menu', 'wpustream_add_options_page');" It now shows up!